We lost a rat the other day. Sunburst was pretty heartbroken about it. All the kids were. Me, too. I'm not sure what happened, but I have a pretty good guess. After doing a bit of research online, I think what we thought were initial quirks turned out to be some kind of respiratory sickness. What we interpreted as cuddly and lazy was probably lethargy. All that noise she made when she was sleeping? Probably wheezing. So she was sick when we got her... and we just didn't know better. Go us! Actually, I wasn't there when the rats were picked out, but Sunburst said that they weren't allowed to handle the rats at the store-- could be a language misunderstanding? It's hard to tell sometimes. So now we're down to one-- just little Miss Pepper, who truth be told, has been sneezing since we got her. I read online that this is not a good sign either, but she's very energetic... so there's hope. If all goes well with her, we'll have to find her a new rattie friend to play with. Rat death already... not what I had bargained for. That's for sure. Sunburst received this as a birthday gift from the neighbors, and they recommended it as a great read aloud. Boy were they right! I have never seen my kids get ready for bed faster than when they know that Mom is going to read some more of the Ronia story. 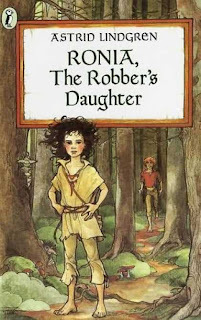 If you're not familiar with it, Ronia is the daughter of robber Matt. They live out in the woods in an old castle and rob people that pass through. There's another band of robbers in the woods, their arch enemies-- the Borkas. When the Borka robbers end up moving into the other half of the castle things get interesting, especially when Ronia befriends Birk Borka, a kid her same age. What happens next? I don't know... we're still reading. All three of them are thoroughly mesmerized by the story, including 4-year-old Kitty Bill. Admittedly, it's not appropriate for him in its entirety-- I'm not even sure it's appropriate for me! !-- so I'm skipping over some of the scariest parts involving the the wild harpies and the gray dwarfs. The wild harpies live in the woods and feed on fear. That's fine-- so there's something scary in the woods. Point made. But as far as the dialogue goes, do they really need to go on about how they will "scratch and bite you until the blood runs" or whatever nonsense they keep carrying on about? No. I think that's taking it too far in a book for kids. The gray dwarfs aren't much better. They threaten to "bite and strike." So whenever I get to the bloody scary parts, I'm picking and choosing the words I want to read pretty carefully. Speaking of great books, Moonshine has finally found some reading material that interests her. 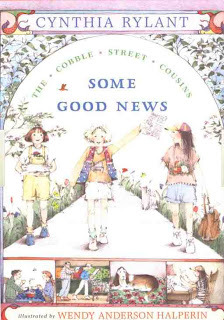 The Cobble Stone Cousins series is about three nine-year-old girls who do stuff, like make a newspaper for their street, go to a wedding, and help their aunt at her flower shop. They are very sweet beginning chapter books-- just the thing for Moonshine who has been trying very hard to love The Magic Treehouse books or the Secrets of Droon. Moonshine is reading up a storm these days. Thanks to the Cobblestone Cousins, she is finally enjoying reading on her own. Yay! Moonshine has been knitting since she was four. The ability came on suddenly after a stomach virus. Stranger things have happened. Since then she has knit in fits and starts. She has finished a few projects-- simple dolls, purses, washcloths-- some with help, some on her own. Most recently she has been working on a sweater for her doll. It's a pattern we're making up as we're going along by holding it up to the doll. It's not very exciting or interesting. The yarn was pretty in the skein, but knit up it kind of looks like vomit. Anyway, she hasn't worked on it much, and I don't have the heart to push her on it. I've seen her wistfully watching Sunburst work on her knit foxes-- and I'm feeling like she needs a more inspiring project. 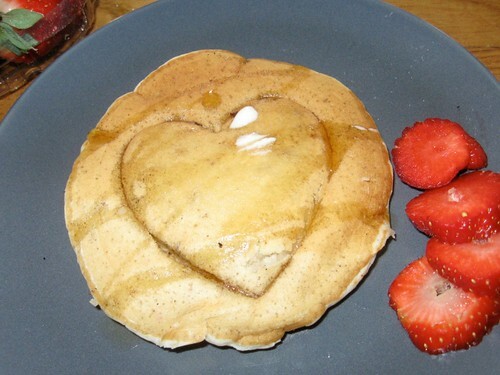 Something that doesn't look like vomit. Something that she can visually conceptualize. And something that will push her skills to a higher level. She can knit and purl with a fair amount of ease, but I suddenly realized, I had forgotten to teach her how to stripe. In the past I just did it for her. It's time, don't you think? 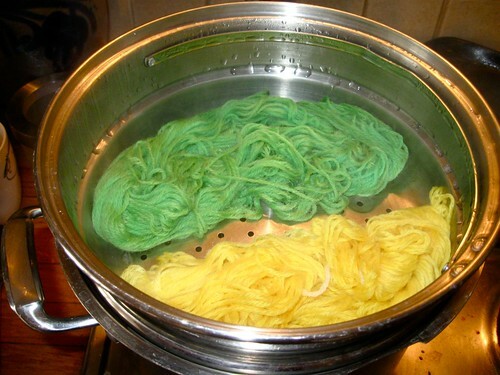 While I was thinking about it, I figured why not let her dye the yarn like our friends in Wales do. I had two skeins of Knit Picks Bare yarn lying around, so we roughly divided each one into thirds and made six small skeins. Dying them was "easy, peasy," as Moonshine has taken to saying. We soaked them overnight in a vinegar water mix, and then she dyed them with food coloring mixed in water. 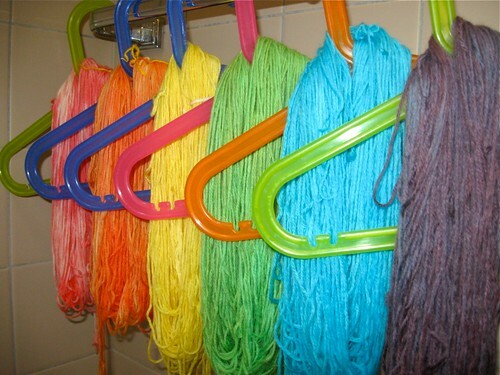 We dyed the yarn in small garbage bags for easy clean up. The purple isn't as pleasing as we'd hoped... but it will do. We heat set the dyes with steam. Here they are in the steamer basket. 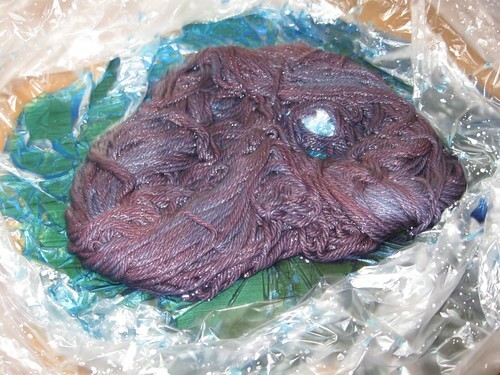 We had to be careful to keep the skeins from touching, or else the dye transferred. Then we spooned the steamed yarn into a colander to cool a bit. Since we used superwash yarn, we didn't have to be too careful about felting. 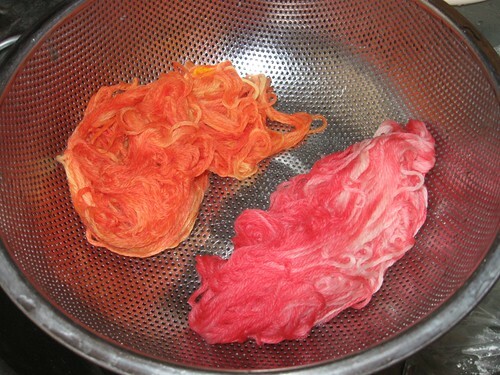 Once they cooled enough, we soaked each skein in a bowl of water to wash out the vinegar smell and any extra colorant. We hung them up to drip dry in the shower, and the next day we transferred them over to the radiator. As punishment... no, not really... I'm having Moonshine and Sunburst work together to wind them into balls. There has been a rift growing between them lately, mostly an age thing (I hope! ), so I thought having them work together would be a nice start. 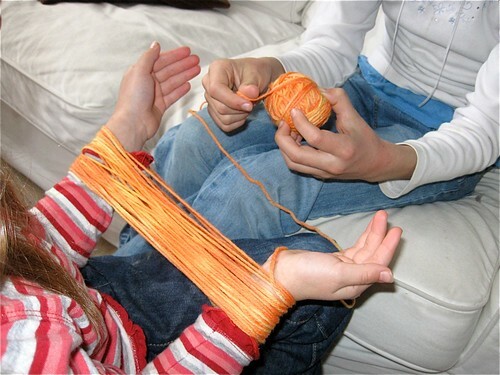 It takes a lot of patience to hold yarn for someone. They have been taking turns holding and winding. I think it's helping. Today they have been much more cooperative with each other, and Moonshine is excited to get to work knitting her new project: a rainbow-striped flute case. I've been very sporadic about mentioning birthdays on the blog through the last few years. I don't have any good reasons for that... but I aim to do better. 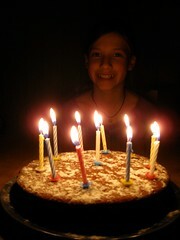 Sunburst turned ELEVEN the other day. Holy cow! I can't believe we've been doing this parenting schtick for eleven years already! It seems like only yesterday she was smearing food in her hair and flushing miscellanea down the toilets. Now she's a pre-teen and experiencing all the fun that goes along with that-- mostly staring wide-eyed through the windows of Claire's and contemplating new earrings (she got those pierced last birthday). I know she was wishing for a special new pair for this birthday. She was hoping for other typical presents, too-- books, craft supplies, games, and... a rat. Yep, I said Rat. Disgusting, eh? It wasn't at the top of my list either, but somehow she got it into her head that having a pet rat would be a fine idea. We studied them last year during our man and animal block, though I admit she was already smitten by then. Shortly after that she presented her dad and me a heartfelt proposal detailing how she would take care of a rat if she was allowed to have one. A heartfelt proposal, with drawings no less... how can you say no to that? We couldn't. I was reminded of something Charlotte Mason said (and I'm paraphrasing here) about how children need something to love. Something to think about, to take care of. 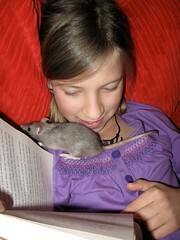 Eleven is surely old enough-- why not a rat? When we got back from the States Einstein took her into the pet store to pick out a rat. It was easy, peasy. One came right up to the glass and made eyes at her. "Pick me! Love me!" And then the pet store people informed Einstein that, by Swiss law, they had to buy two. Isn't that crazy?! Apparently this Noah's ark-ish law applies to a few other animals, not just rats. Alas, it was not "buy one, get one free." I present you with our rats: Pepper and Pancake. Sunburst and her rats have become fast friends. They are extremely tame. They love to crawl around her dollhouse and snuggle with her while she reads. She loves them. She loves to think about them. And she loves to take care of them. And she's already making headway trying to train them. And me? I had agreed to rats on one promise from her-- that under any circumstances I would not be required to deal with them, including touching them. I was serious. The idea of rats seriously disgusted me. I imagined them running around the house pooping on everything and chewing up my knitting. But now that I've seen them... they're beautiful. They're sweet. And they are VERY clean animals. I can't help myself. 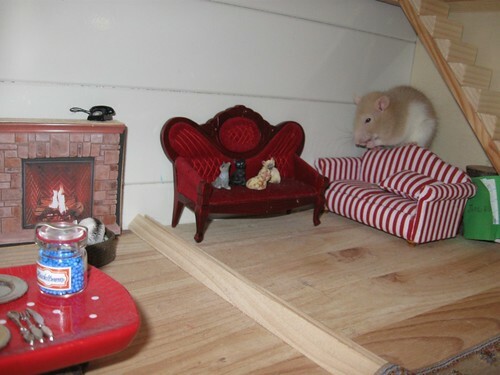 I'm in LOVE... with rats!! Who knew?? Are you still here after my long absence? Thanks so much for waiting. We just returned home from a WONDERFUL three weeks back in the states. It was fantastic to be home home again. We had warm Arizona sunshine, horse-riding, hugs galore, family dinners, weeping at the sight of Trader Joes and Whole Foods, seriously late nights with my mom, brother, and sisters... plus I got to meet the boyfriends (eek!). We consumed an inordinate amount of coffee, distributed 50 pounds (I kid you not!) of Swiss chocolates, bought two suitcases full of used books, played numerous bouts of Wii Grand Slam Tennis with Einstein's parents, met the newest baby of the family, and most importantly, loved on our grandmothers. Quality, important stuff, all of it. My well is filled up and I'm ready to tackle anything! Starting with getting back into the groove after a VERY long homeschooling break. We spent our first week back fighting off a nasty jet lag/flu cocktail (this cough is the pits!) 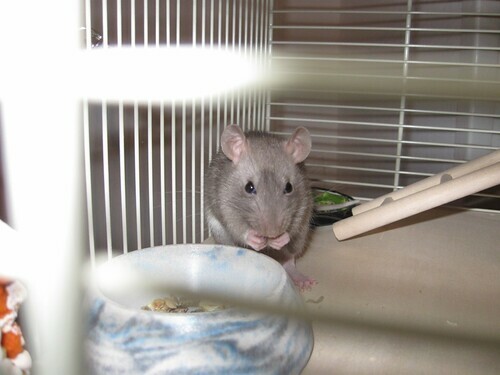 and welcoming a pair of baby rats for Sunburst's eleventh birthday. More about the rats coming tomorrow. Today I'm off to unearth my lesson plans. They are here somewhere... I hope.